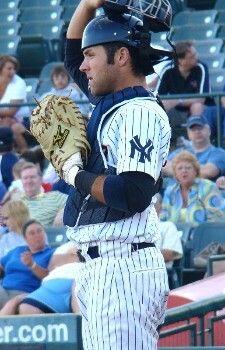 The day finally arrived for Austin Romine. Really, today seemed like a tale of two days for him. Word got out before the game that Romine was likely headed to Triple-A Scranton…which made it all the more surprising that he’d be playing to begin with tonight in Trenton. But there he was, batting third and serving as the team’s designated hitter. After the game, however, after being serenaded by a round of applause from his teammates in the clubhouse, he was much more willing to talk about what had finally become a reality. But at the same time, it was also a little bittersweet for him to leave a team he’d been with, for all intents and purposes, the last two seasons. “I enjoyed playing with a lot of these guys on this ballclub,” Romine said. The personable 22-year-old said that he hadn’t been made aware of any plans to possibly summon him to the Bronx following his stint in Scranton. “Right now, I’ve got (five) games there, and we’ll go from there,” he said. Romine, who endured various injuries this season, said that he is physically fine to continue playing and hopes to get some time behind the plate over Scranton’s final five games. This entry was posted on September 1, 2011 at 11:46 pm and is filed under Uncategorized. You can follow any responses to this entry through the RSS 2.0 feed. You can leave a response, or trackback from your own site. Will next season start the Sanchez-era in Trenton?